The Assistants feature allows you to assign multiple administrator roles (Assistants) within your ClassMarker account, with different access permissions that you can set for each Assistant. You can give your Assistants full permissions or give them specific types of permissions, such as viewing results only, managing tests, categories and the question bank or to create themes only for a designer, or to upgrade your account only for your accounts person. Provide your accountant with a login with the permission to only upgrade your account and download receipts or your web designer a login to only have the permission to create a theme for tests. Or perhaps, you need to have someone be in charge of adding questions into your account, you can provide them with a login, specifically for this task. Interested in using Webooks/API Integration? 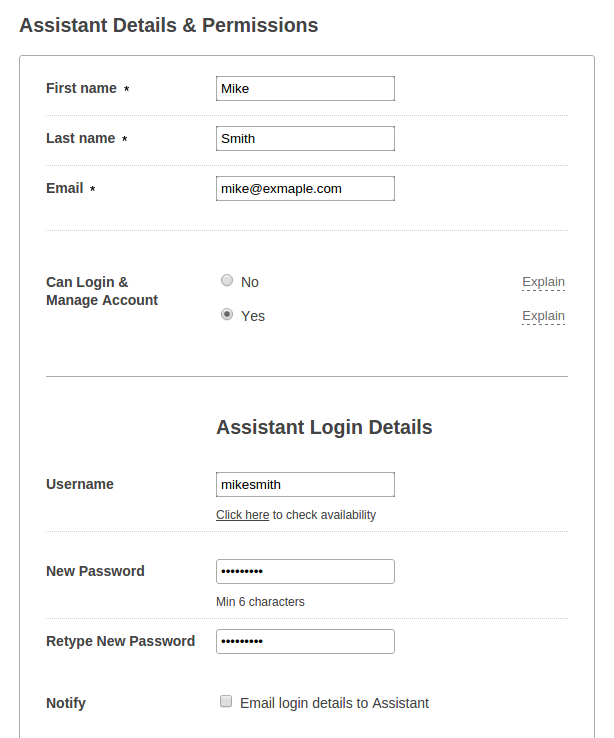 Create a login for your web developer to access only the 'techy' side of the account. There are many possibilities of how you can create custom administrator roles. Each Assistant you add to your account can have their own username and password to login. When you first create an Assistant, you can choose whether this Assistant can login and manage your account or not. If you choose 'Yes', this will allow the Assistant to access the account with the permissions you select. If you choose 'No', this will simply allow the Assistant to be selected to receive results via email without having any login permissions. When creating their login, you will enter their first name, last name and an email address, along with creating their username and password (username and password are only required if giving access to the account). The Assistant will use their login details to gain access to the account the same way you, as the administrator would by using the Login box on our home page at ClassMarker.com. Types of permissions: ClassMarker Assistants permissions are divided into 3 sections - Test Results, Manage Users and Manage Content. You can check all permissions or just certain ones, depending on the access to the account that you would like each Assistant to have. Selecting permissions under Test Results will allow Assistants to view, grade and delete results. Selecting permissions under Manage Users will allow Assistants to assign tests, manage groups and members and manage access lists. Note: When deleting groups and members, those members results will be deleted as well. 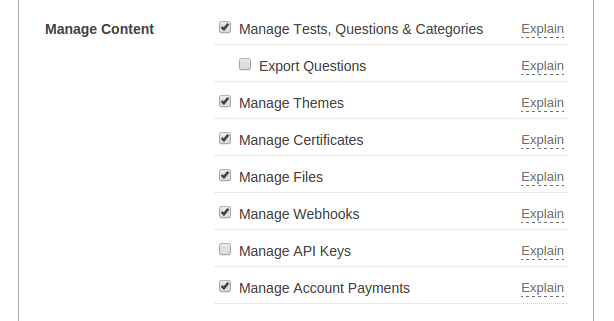 Selecting permissions under Manage Content will allow Assistants to manage tests, questions and categories, export questions and categories, manage themes, certificates, files, webhooks, API and account plans. View, Add, Edit and Delete Tests, Questions and Categories. Please Note: Assistants with 'View Results' or 'Manage Questions' permission can view test questions and answers within results pages. If these settings are not selected, the Assistant is then not able to see questions, download them, etc. As you can see, the Assistants feature has been set up in a very flexible format to allow the selection of the exact permissions you require for each of your Assistants.